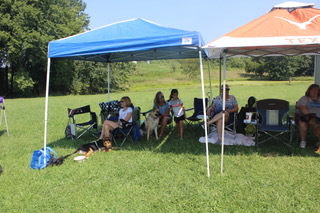 The club sponsored a dog pool event on Sunday August 12th from 11am to 2pm. Members and families came out to enjoy the summer fun! 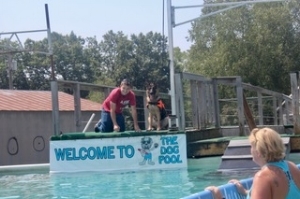 We had a brief introduction from member Darcy Seeger and then dogs were given a time slot to try their swimming/retrieving/jumping skills in the pool. We brought picnic lunches and drinks to enjoy while we visited and enjoyed the “splash zone” for cooling off on this hot day! Everyone had a blast and we are eager to try it again!!! • Saturday, September 29, 11:00 – 3:00 p.m., General Meeting and Annual Club Picnic, Shelter House 1, Smith's Fork Park, Smithville, Mo. Members will have an opportunity to paint their dogs on a 16x20 canvas for $55.00. Visit the Painting with a Twist website to read more about this fun experience. Contact Susan Hunt if you have questions. Pat Robinette is a fairly new member of the club and already has made great strides with her new pup, Ruger. Pat shared a little about herself and her interest in the breed. Hi! My name is Pat Robinette and I joined the club in March 2018, two months after picking up my puppy, Ruger. A little about myself. I have lived in the Kansas City north area my entire life. Currently I live in Smithville and have lived there since 1996. I worked for the state of Missouri since 1992 and retired at the end of December! I began my career with the state as an Examiner with the Real Estate Commission. We would audit real estate brokers and made sure the statutes and regulations were followed. Then in 2007, I moved over to the Gaming Commission where we audited the casinos on the west side of the state and made sure they comply with all statutes and rules. It was a nice career but now I LOVE being retired as it gives me time to work with Ruger. 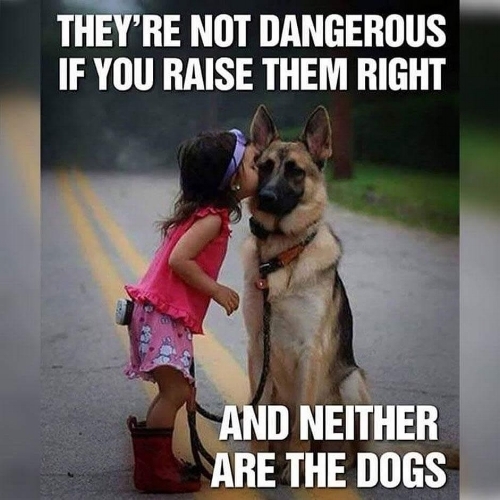 So why a German Shepherd? I grew up watching Rin Tin Tin and have always wanted a GSD. However, that dream was not fulfilled until I retired. I have always had dogs, but they have always been small. My last two dogs were/are Pugs. Tigger passed away at 16 years and 2 days in 2015 and Abby is 12 almost 13 and going strong. She was not at all happy when I brought the “pup” home that was as big as she was when he was 3 months old. While working at the Gaming Commission, I worked with Brad Baker. Several times we talked about German Shepherd dogs and he told me about the German Shepherd Dog Club. He also invited me to an event at Macon Park that I attended and knew then that once I finally had a dog, I would join the club. I am very thankful for the club! I have met many wonderful people who have all gone out of their way to help me train Ruger and to learn about the breed. I was in complete surprise to find out that the instructor where I was going to take obedience classes was also a member of the club! A big thank you to Rosi for teaching us so we can learn the skills needed for both of us to succeed! I attended my first dog show (other than watching Westminster!) in June and intend to go to many more! The meal will be potluck with the club providing the meat. Bruce Hudson volunteered to chair coordinating the picnic. A question veterinarians' get asked all the time by pet owners is, “Why does my dog’s urine seem to kill my grass?” And “Is there anything I can do about it?” Actually, there is. Your pet’s urine pH has a lot to do with whether your grass stays green. Since winter is on the way and in many parts of the U.S. people won’t be thinking about their lawns for a few months, I thought now would be a good time to offer some tips on how to naturally adjust your dog’s urine pH so he or she will be less likely to burn the grass next spring and summer. There are three primary reasons why dog urine burns grass: alkaline urine pH, the concentration of the urine, and its nitrogen load. The most important of these factors is urine pH. The best way to find out which is the causative factor in your dog’s situation is to drop a urine sample off at your vet for a urinalysis. In my experience, urine nitrogen can affect grass health, but only when the nitrogen load is very high. Normal nitrogenous waste excreted in urine should not kill the grass. But if a dog’s urine pH is in the correct range and his urinalysis shows a high nitrogen level, some pet owners have had success reducing urine nitrogen levels with products like Dog Rocks. Dogs are carnivores and should have a slightly acidic urine pH of between 6 and 6.5. (The higher the urine pH, the more alkaline it is.) Vegetarian mammals like rabbits and horses naturally have a very alkaline urine pH. Human urine is naturally slightly more alkaline (6.5-7), and many pet owners wrongly assume their dog’s body functions in the same manner as their own. It’s important to keep your healthy dog’s urine pH below 7, because a higher pH will not only burn your lawn – it will predispose your dog to developing struvite crystals. The flip side of that coin is a urine pH below 6, which can cause dogs to develop a different type of problem -- calcium oxalate stones. So for the health of both your dog and your lawn, you should strive to keep your pet’s urine pH right around 6.5, and no higher than 7. I recommend buying pH strips from your vet or at the local drug store to check your pet’s urine pH at home so you know when it’s in or outside the desired range. In the morning prior to feeding your dog is when you should collect the urine sample. You can either hold the pH tape in the stream of urine while your dog is voiding, or you can catch a urine sample in a container and dip the tape into the sample to check the pH. This should be done immediately with a fresh sample to insure accuracy. Don’t measure urine pH throughout the day after feeding your pet. Often, a dog’s urine pH can be maintained naturally between 6 and 6.5 by feeding a species-appropriate diet. To reduce urine pH, you must feed a low-carb, grain-free, potato-free, and preferably fresh or at least canned food diet for the increased moisture content. If you’ve managed to get your dog’s urine pH into the 6 to 6.5 range and his vet says his urinalysis is perfect, but he’s still killing your lawn, there are a couple of other ways to deal with those burn marks. Officials in Kansas City, Missouri, are seeking input from residents on numerous proposed changes to the city’s animal control laws. This includes amending the current ownership limit laws and removing breed-specific provisions. Other considerations include mandatory spay/neuter and regulations on tethering and outdoor shelters. The city has set up a website with a questionnaire to provide a forum for public comment and input. This is a great opportunity for those who reside or who actively participate in events in Kansas City to speak up on behalf of dogs and responsible dog owners in the city. Following a fall 2017 city audit of animal control processes, a plan was established to review and make recommendations to the City Council for modifications to the code. A stakeholder group has been established to guide the approach to animal code modifications. This stakeholder group helped establish areas for public input using previously received feedback, and will be involved with reviewing the public input received and recommending code modifications to the City Council. The ordinance currently allows residents to legally keep 4 or less dogs, cats, OR potbellied pigs (or a combination of these animals), over the age of 3 months. Some open-ended feedback has suggested increasing the number of pets that can be legally owned. QUESTION: Should the ordinance be changed to allow residents to keep more than a combination of 4 dogs, cats, or potbellied pigs? If yes, how many should be allowed (altogether or of each type)? Current code requires that an animal must have the opportunity for adequate daily exercise (as determined by the supervisor of animal health and public safety). This requires that an owner, keeper or harborer must offer some freedom from continuous chaining, stabling and tethering. Any restraint must prevent the animal from being tangled or injured by the restraint. Some open-ended feedback has suggested adding additional restrictions on tethering dogs. QUESTION: Should the ordinance be amended to make it unlawful to: a) tether dogs without a collar or harness device; b) use a tether less than 10 feet long; c) use a tether or collar that inhibits free movement due to the weight of the device; d) tether a dog in a manner than has the potential to cause injury/strangulation/entanglement. Some open-ended feedback has suggested additional definition of adequate shelter. QUESTION: Should this be redefined to provide clarity on what is an adequate shelter? If so, what should be included? Code requires mandatory spaying and neutering of all pit bulls. QUESTION: Should this section be repealed? Mandatory Spay and Neuter of Cats and Dogs. Some municipalities have instituted mandatory spay/neuter of pets to help control overpopulation. KCMO’s code does not require the mandatory spay and neuter of cats and dogs except pit bulls. QUESTION: Should the code be amended to require mandatory spay and neuter of all cats and dogs? Visit the AKC Legislative Action Center’s Key Issues Pages for talking points on these issues. Also visit the GR Toolbox for sample letters and other materials to help communicate on mandatory spay/neuter, breed specific laws, ownership limits, and tethering. Visit http://kcmomentum.com and fill out the questionnaire. Please keep your comments constructive and polite, and take a moment to thank the city for allowing public input on these important issues. The forum will close Tuesday, September 4th. AKC Government Relations will continue to monitor these issues as they advance. For questions or more information, contact doglaw@akc.org.